On occasion, I realize that I am more interested in taking pictures of birds than identifying them and adding them to my life list. While I carry a field guide and pair of binoculars with me, I am somewhat loath to pull them out and spend the time figuring out what I am seeing. I would much rather catch them in a provocative pose that I can sell than figure out if they are consenting adults or first-offense juveniles. Nowhere is this ambivalence clearer then when I am shooting peeps, those little shorebirds that never quite let me get close enough to ID them. Perhaps if I were more patient and had a steadier hand, I could define the niceties of plumage to identify a 8″ bird at 100′. But no, I can only discern gross differences in size and color at 100′. So I use my camera to capture the details. 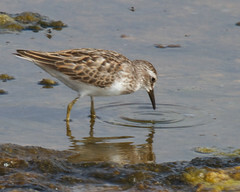 The shape of the bill, the color of the legs, whether the breast is spotted or white. 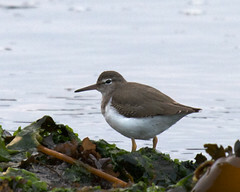 All of the little things a good birder picks up, I let my camera grab. Yes, you might say that I am lazy. Except for the fact that I then spend hours going over the photos, wading through field guides, discerning the subtleties, and narrowing everything down to an ID. Because in the end, no matter what I said at the outset of this post, identifying the birds that I shoot is important to me. I really want to know what peep I saw at the beach today. 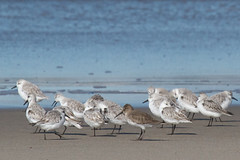 This entry was posted in birds, technique and tagged birds, non-descript, peeps, shorebirds, small by Tom Clifton. Bookmark the permalink.